Huskies goalie Jordon Cooke makes one of his 51 stops in a loss to U of A.
Jordon Cooke was a little bit too busy time around. On Friday night, the sophomore netminder made 44 saves to help his University of Saskatchewan Huskies steal a 3-2 victory over the visiting University of Alberta Golden Bears at the ancient Rutherford Rink. The Huskies netted their three goals off of 25 shots. On Saturday night at the Ruthy, the Huskies tried to lean on Cooke again to come up with a steal. The Leduc product did everything he could, but the Golden Bears managed to mount more pressure and chances at the U of Saskatchewan net than they did one night earlier. When the dust settled, Cooke made an incredible 51 stops, but the Golden Bears skated away with a 4-2 victory improving to 5-2-1. The Huskies, who lost their first regular season match to fall to 7-1, mustered 22 shots at the U of A net. Cooke had to stand on his head almost from the opening puck drop against the two time defending Canadian Interuniversity Sport champions. The visitors busted through on their 14th shot, when defenceman Jordan Rowley popped a power-play goal at the 12:19 mark of the opening frame. Golden Bears goalie Luke Siemens was pretty much a spectator over the first 20 minutes, as his side held a 20-4 edge in shots on goal. Jordan Rowley scored twice in a winning effort for the Golden Bears. U of A went up 2-0, when sophomore forward Stephane Legault scored unassisted just 56 seconds into the second frame. The Huskies pulled to within 2-1, when Jesse Ross scored at the 6:27 mark of the second. Ross’s goal was just the ninth shot on net for the Huskies. The goal didn’t slow the Golden Bears momentum. Before the second ended, the visitors scored two goals just 86 second apart from each other to go up 4-1. Rookie forward Jayden Hart fired home his third of the season, and on the power play, Jordan Hickmott and Levko Koper combined to set up Rowley down low on a tick-tack-toe passing play for his second of the game. The Huskies tried to stage a rally in the third. Ross picked up his second of the contest at the 5:46 mark to cut the gap to 4-2, and rookie forward Kohl Bauml was unable to score on a couple of breakaway chances. While the Golden Bears were unable to score in the third, they controlled play outshooting the Huskies 20-4 in the frame. Siemens made 20 saves to earn the win in goal for the visitors. Cooke turned back chance after chance to give his side life, but the Huskies skaters weren’t able to find an extra gear and were often trapped in their own zone. After three straight home games, the Huskies hit the road to Calgary to face the Mount Royal University Cougars (4-2-2) this coming Friday and Saturday. Leah Bohlken had the lone goal in a Huskies setback. The U of Saskatchewan women’s hockey team saw their four game winning streak come to an end at the hands of a determined host U of Alberta Pandas squad. On Saturday night in Edmonton, the visiting Huskies jumped out to a 1-0 lead in the first period, when rookie defender Leah Bohlken netted her second tally of the season. From that point onward, it was all Pandas as far as the scoring was concerned. The Pandas responded with five unanswered goals to skate away with a 5-1 victory. They scored three times before the first frame ended, and they added two more tallies in the third. Alex Poznikoff scored twice for the Pandas, who received singles from Sasha Lutz, Amy Helfrich and Erinn Baddock. Dayna Owen made 14 stops to earn the win in goal for the Pandas (5-4-1). Cassidy Hendricks made 31 stops taking the loss in goal for the Huskies (7-2-1). One night earlier, Hendricks stole a victory for the Huskies making 28 saves in regulation and turning away all three shooter she faced in a tiebreaking shootout to power the Huskies to a 3-2 win over the Pandas. U of S had just 10 shots on goal in regulation and overtime in that contest. The Huskies women’s team now enjoys a bye week before returning to action on Nov. 13, when they travel to Vancouver to face the University of British Columbia Thunderbirds (6-3-1). If you have any comments you would like to pass along about this blog post, feel free to email them to stankssports@gmail.com. To see more game photos, check Twitter @StanksSports. Logan McVeigh fires home an equalizing goal for the Huskies. The University of Saskatchewan Huskies men’s hockey team might be able to go out for Halloween as the Calgary Flames of the “Iggy” and “Kipper” era. When Jerome Iginla and Miikka Kiprusoff played for the Flames, the joke was Iginla would pot a couple of goals and Kiprusoff would make like 47 save to lead the Flames to a 2-1 victory, which was often the story when those two played together in Calgary. 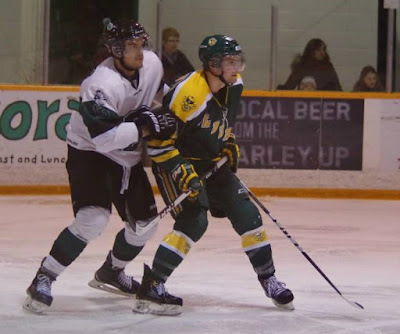 On Friday night at the ancient Rutherford Rink, Huskies faced their toughest foe of the season in the two-time defending Canadian Interuniversity Sport champion University of Alberta Golden Bears. Huskies netminder Jordon Cooke played the role of Kiprusoff making 44 saves, Logan McVeigh took on the part of Iginla scoring a couple of goals, and those performances equaled a 3-2 comeback victory for the Dogs. The 477th all-time meeting between the two historic rivals definitely had drama. Just 58 seconds into the contest, the Huskies scored on their first shot of the game, when rookie forward Andrew Johnson slipped home an on-ice shot past Golden Bears goalie Luke Siemens to give the hosts a 1-0 lead. The defending national champs responded by throwing everything including what seemed like the kitchen sink at Cooke. Even an extended rust break couldn’t halt the Golden Bears onslaught of shots. The lengthy break was caused, when a puck went into the Ruthy’s roof causing one steel beam to drop a straight line of rust across the ice, while two other beams added sprinkles of rust. With 58 seconds to go in the first, the Golden Bears were able to even things up at 1-1, when star forward Jordan Hickmott deflected home a point shot from defenceman Jordan Rowley. Jordon Cooke made 44 saves to backstop the Huskies to victory. Cooke still made 22 saves through the first 20 minutes to keep the Huskies in the contest. The Golden Bears went ahead 2-1 at the 5:25 mark of the second, when rearguard Dylan Bredo found the back of the net for his first of the season. U of A kept coming at Cooke in waves, but the sophomore netminder slammed the door for the rest of the contest. As the second came to a close, the Huskies started to string a series of good shifts together, which started to turn the tide of the contest. The hosts played their best structural frame in the third, which cued the comeback. Just past the midway point of the third, John Lawrence and Jesse Ross combined to set up McVeigh with a scoring chance in front of the Golden Bears net. McVeigh made no mistake wiring home a shot to the top corner of the U of A goal to tie things up at 2-2. A little over three minutes later McVeigh tucked home the rebound from a point shot coming off the stick of Huskies captain Kendall McFaull to put the hosts up by the eventual final of 3-2. Down the stretch Cooke made a couple of nice glove saves to preserve the victory, which allowed the Huskies to remain undefeated at 7-0. Siemens made 22 stops as the Golden Bears dropped to 4-2-1. The two teams go at it again on Halloween night Saturday at 7 p.m. at the Rutherford Rink. Huskies goalie Cassidy Hendricks frustrated the Pandas. Speaking of robberies, the Edmonton City Police department might be looking to put University of Saskatchewan Huskies women’s team goalie Cassidy Hendricks behind bars for the number she did on the host University of Alberta Pandas on Friday night. Hendricks turned away 28 shots through regulation and overtime, which included making seven saves in a scoreless three-on-three five minute overtime period. The Vancouver product proceeded to stop all three shooters she faced in a tiebreaking shootout to lift Huskies to a 3-2 victory. In contrast, Pandas goalie Lindsey Post only face 10 shots through regulation and overtime and made eight saves over that stretch. Post stopped only one of two shooters in the tiebreaking shootout in her side’s setback. Despite the lopsided edge the Pandas had in the shots department, the Huskies held leads of 1-0 and 2-1 in regulation thanks to goals by star defender Julia Flinton and standout forward Kaitlin Willoughby, who returned after missing two games due to injury. Flinton netted the lone goal in the shootout. Cayle Dillon and Ashley Morin had the regulation replies for the Pandas. The win was the fourth in a row for the Huskies, and it moved them into first place in the Canada West standings with a 7-1-1 mark. They sit a point up on the University of Lethbridge Pronghorns. The Pandas fell to 4-4-1. These two clubs go at it again on Halloween Saturday in Edmonton. If you have any comments to make about this blog post, feel free to email them to stankssports@gmail.com. Huskies forward Michael Sofillas battles two Golden Bears for the puck. You might not even know the whole background story, but games between the University of Saskatchewan Huskies and University of Alberta Golden Bears in men’s hockey can still get the blood running. Their first clash came back on February 27, 1911 and longevity alone is enough to make this rivalry interesting. No one really knows how many times these two teams have met at the ancient Rutherford Rink, which has been the Huskies home for the last 85 years. Going into this weekend, they have faced off 476 times including the non-conference, regular season and post-season encounters. The Golden Bears hold a 312-140-24 edge in those meetings. These “forever rivals” go at it again at 7 p.m. on both Friday and Saturday night at the Ruthy. The Huskies are off to a 6-0 start, while the Golden Bears, who have won the last two Canadian Interuniversity Sport titles, are 4-1-1. 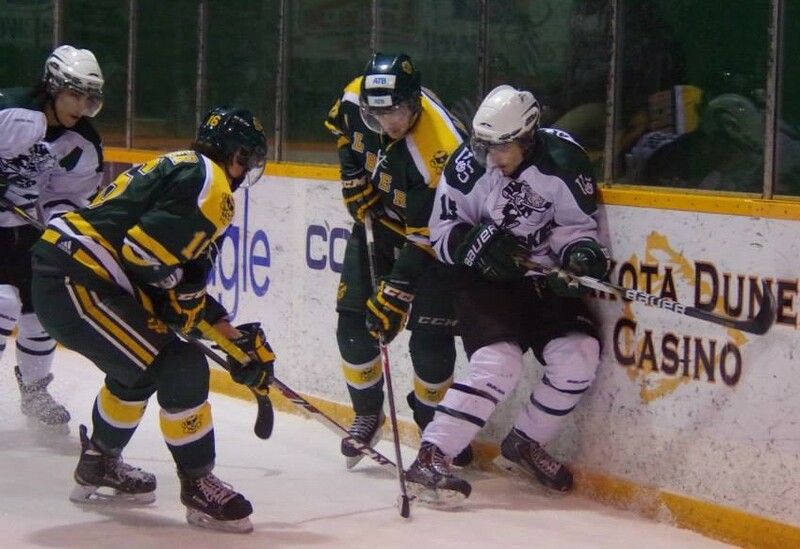 Throughout the years, both these teams have usually hovered together around the top of the Canada West standings. That fact is one of the things that instantly draws people to their clashes. Every year, it seems a new generation of fans heads out to the see the battles between the Huskies and Golden Bears expecting to see an epic encounter. They would expect the generation of fans that saw the two clubs play in previous years and decades saw the same thing. One of the more unfortunate truths in Canada is that Canadians are bad at tracking the history of sports in their country, with the NHL being the lone exception. For that reason, it is hard to remember the battles of the past. On the university campus, the continuity of the story gets lost as each generation changes. The two clubs had a couple of memorable encounters in the University Cup championship game over the past 11 years, and the Golden Bears claimed victory on both occasions. Those triumphs included a 4-3 overtime decision in 2005 at now Rexall Place in Edmonton, and a 3-1 win in 2014 at now the SaskTel Centre in Saskatoon. Huskies rearguard Zak Stebner battles a Golden Bear in front of the net. If you are lucky, you might hear an urban legend story of a past encounter. One of the more humourous ones involved Dave King and Clare Drake. King is recognized as the greatest head coach in the history of the Huskies program, and Drake holds the distinction of being the best head coach the Golden Bears have seen. Apparently after a period one night at the Ruthy, King wasn’t pleased with the decisions his players were making offensively, when it came to shooting puck. He walked out on to the ice and spray painted a circle in the slot of the offensive zone to show where he wanted his players to shoot from. Drake immediately protested saying King couldn’t do that and asked that the Zamboni be brought on the ice to scrape off the spray painted circle. Current Vancouver Canucks head coach Willie Desjardins, who was the captain of King’s 1982-83 national championship Huskies team, confirmed that the spray paint story was true. All Desjardins could do was smile and chuckle when that story was brought up. The most heartwarming moment of the rivalry came back on Jan. 30 involving the late Cody Smuk, who was the Huskie heart and soul glue guy forward. 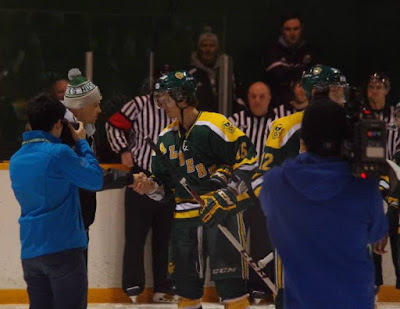 Smuk was battling cancer, and that contest was a fundraising game for him as well as the night the 85th birthday of the Rutherford Rink was celebrated. Smuk dropped the puck for a ceremonial faceoff after undergoing five straight days of chemotherapy treatment. Both teams lined up to shake hands with him. The fact the Golden Bears skated away with a 4-2 win was mostly forgotten. Cody Smuk shakes hands with the Golden Bears on Jan. 30. Everyone remembers that Smuk was incredibly upbeat that night, and he was energized to be at the rink. No one suspected that would be the last Huskies hockey home game he would see as he passed away just under five months later in late June. Smuk’s number 24 was retired by the Huskies last Saturday in a 6-2 home ice win over the U of Regina Cougars and a huge banner of his adorns the wall of one of the rink’s buildings. When the Huskies, who are ranked second in the CIS top ten rankings, and Golden Bears, who are rated third in the CIS top ten, clash on Friday and Saturday, it will be interesting to see if the new recruits the Huskies have added who have increased their pace of play can knock off an older and established Golden Bears side. The Golden Bears will be hoping to show they are still the top university team in the country. For great early season hockey, the Ruthy will be the place to be this weekend. Julia Flinton, left, has played at an all-world level for the Huskies. The Huskies women’s hockey team vaulted to ninth in the Canadian Interuniversity Sport top ten ranks this week with their 6-1-1 start. They head to Edmonton for road clashes against the University of Alberta Pandas on Friday and Saturday night. The Pandas (4-4) are 10th in the CIS top ten ratings. Last week, the Pandas were ranked ninth and the Huskies were rated 10th. Marley Ervine and Julia Flinton, who are both fifth year veterans, lead the Huskies in scoring with eight points. Ervine has three goals and five assists, while Flinton, who is one of the best offensive defender in the country, has a goal and seven assists. Alex Poznikoff and Janelle Froehler both lead the Pandas with six points. Poznikoff has five goals and one assist, while Froehler has three goals and three assists. Both clubs have won their last three straight. The Huskies are in the middle of a stretch, where they play five straight road games. Their next home date is Nov. 20, when they host the University of Manitoba Bisons at 7 p.m. at Rutherford. Logan Fischer rumbles into the end zone for a Hilltops touchdown. It seems you can always count on Logan Fischer. The venerable Saskatoon Hilltops believed their best option to win Sunday’s Prairie Football Conference final was to give the ball to their physical workhorse tailback, who led the team with 794 yards rushing in seven regular season appearances. Fischer was handed the rock 23 times, and he rumbled for 170 yards and scored four touchdowns to help the Hilltops dump the Calgary Colts 38-16 at Saskatoon Minor Football Field. The win allowed the Hilltops to repeat as conference champions and advance to the Canadian Junior Football League title game, the Canadian Bowl, for a second straight year. The Hilltops, who are the defending CJFL champions, will host the national junior final on Nov. 7 at 1 p.m. at Saskatoon Minor Football Field against the Okanagan Sun. The Sun, who are 12-0 overall, crushed the Vancouver Island Raiders 54-0 in the British Columbia Football Conference final on Sunday in Kelowna. Fischer was excited that the 2015 season will go to the last possible game his club could play. “Every single night it is a blast with the guys,” said Fischer. “This is the closest group probably that we have had. Looking at the final score, one would think victory came easy to the storied Hilltops, but that was far from the case. The first quarter was a defensive slugfest that saw the only points come from a 17 yard field goal from Hilltops kicker Brett Thorarinsson. The Hilltops defence benefitted from the fact star fifth-year defensive tackle Blake Adams returned after missing a game with a left knee injury. Early in the second quarter, the Colts had a chance to draw even with a 28-yard field goal, but kicker Kyle Bryne’s attempt was wide counting for a single that cut Saskatoon’s lead to 3-1. From that point, the Hilltops really started to churn out the yards along the ground. Fischer scored his first major of the day on a slashing run from 25 yards out and put in his second score on a plunge from a yard out to give the hosts 17-1 edge. The grad of Saskatoon’s Bethlehem Catholic High School was quick to credit his success to the Hilltops offensive line that included starters Terry Thesen, Nathan Heide, Jordan Hydomako, Drayke Unger and Tyler Hoath. Hilltops DT Blake Adams takes down a Colts ball carrier. “When it comes down to it, it is all about the battle in the trenches,” said Fischer. “Our O-line just absolutely dominated. The Colts battled back putting together a two-minute drill drive right before halftime. The march was capped by a two-yard touchdown run by Dylan Minshull with 15.2 seconds to play in the second quarter that cut the Toppers lead to 17-8. Near the start of the third quarter, the Colts put together another long offensive drive, which looked like it would result in more points. The series ended when Calgary quarterback John Kiesman unloaded a dangerous throw across the middle of the field that was intercepted by Hilltops safety James Vause. Vause would add a second interception the fourth quarter, which was also his fourth pick in Saskatoon’s two post-season games. Things weren’t totally smooth on offence for the Hilltops. They didn’t have their greatest outing when it came to passing the ball, as starting quarterback Jared Andreychuk completed just 7-of-17 passes for 149 yards. The incompletions included drops from receivers and a couple of missed throws by Andreychuk. With the passing game sputtering, the Hilltops continued to feed Fischer the ball. Right before the third quarter ended, he ran in a score from 24 yards out for his third major of the game to give the Hilltops a 24-8 lead. Early in the fourth quarter, Fischer drove in from a yard out for his fourth score to put Saskatoon up 31-8. DT Matt Kozun hauls in a TD catch for the Hilltops. The lead increased to 38-8, when Andreychuk hit defensive tackle Matt Kozun, who lined up as a tight end in a short yardage situation, for a two-yard scoring toss. The Colts accounted for the last major, when Kiesman hit Jesse Kuntz on a 20-yard post pattern with 8.7 seconds remaining on the clock. Kiesman hit Grayson Javorsky with a short pass for a two-point conversion. Calgary’s signal caller finished the contest completing 27-of-46 passes for 375 yards. Calgary piled up 486 yards of total offence, while the Hilltops had 350 total yards. The statistical difference in the game came from the fact the Colts turned the ball over three times and had 180 yards in penalties. The Hilltops didn’t have any turnovers and only had 30 yards in penalties. With the win, Saskatoon improved to 9-1 overall, while Calgary finished at 6-4. With the PFC final in the books, Fischer was excited about playing the CJFL title game on home turf, and he wants his squad to put out another strong effort at home in about two weeks. “That is a tremendous feeling,” said Fischer. “We came out here and this is our home. We take that very seriously. The Hilltops claimed last year’s Canadian Bowl 39-14 over the Rams in Langley, B.C. Saskatoon has won 17 CJFL titles. The Sun have won two CJFL championships, but they haven’t appeared in the Canadian Bowl since 2004, when they fell 24-7 to the Huskies in Edmonton. Okanagan’s last CJFL title came in 2000 with a 36-28 victory in Kelowna against the visiting Hilltops. Colts DB Conner Robinson wore #23 to honour late teammate Brock Ramias. The Colts played Sunday’s PFC final with heavy hearts. On Monday, former Colt player Brock Ramias, who was with the team last season, was found dead in Kinsmen Park in Lethbridge. Ramias was a high school football star with the Lethbridge Collegiate Institute Rams. The Colts dedicated playing Sunday’s game to the memory of Ramias. Calgary defensive back Conner Robinson wore #23 instead of his normal #3 to honour his former teammate. Robinson, who is also from Lethbridge, and Ramais were close friends and played together in high school with the Rams. Ramias wore #23 during his high school years. He was only 20-years-old, and autopsy results indicate his death was non-criminal in nature. If you have any comments you would like to pass along about this post, feel free to email them to stankssports@gmail.com. Check out more game photos on Twitter @StanksSports. Will the up and coming Colts knock off the storied Hilltops? Head coach Tom Sargeant, centre, gets fired up on the Hilltops bench. The Prairies Football Conference championship game is anything but a lock for the venerable Saskatoon Hilltops. The up and coming Calgary Colts are out to prove it is their time. For the second straight year, the Hilltops and Colts will meet for the conference title. Saskatoon topped the PFC’s regular season standings with a 7-1 mark, and their only loss was a 34-4 setback to the Colts in a match that closed the regular campaign for both sides. The Toppers starters rested for most of that game, but the Colts moved the ball in that contest no matter who was on the field. Saskatoon enters the contest as favourites and as the established powerhouse. They are in search of their 18th Canadian Junior Football League championship, and in the previous 17 national title wins, Tom Sargeant has been part of 11 of those victories as a player (once), assistant coach (two times) and head coach (eight times). Calgary are the upstarts, who are two seasons removed from a 0-8 campaign. Last season, the Colts hired legendary British Columbia Football Conference head coach Matthew (Snoop) Blokker, and he guide the Colts to a 4-4 record and berth in the PFC final. In year two under Blokker, the Colts finished the regular season with a 5-3 mark. Last season, the Colts appearance in the PFC final was a surprise one and a bonus for a rebuilding program. This year, the Colts had expectations to make it this far, and they also have hopes of advancing to the Canadian Bowl and possibly winning their first CJFL title since 1990. The Colts are out to make a statement that they have arrived, and it is their time. Hilltops quarterback Jared Andreychuk fires off a pass against the Colts. The Hilltops are loaded up with 16 players in their fifth and final year of eligibility. They want to send a not so fast message to the upstarts that their time hasn’t arrived just yet. Saskatoon has a big edge in the experience department in big games. The Toppers players know how to rebound, if plays and moment doesn’t slid their way for a time. While they usually win going away, they have the ability to regroup and rally back, and that was shown on Sept 12, when they trailed the Thunder in Regina 25-10 in the fourth quarter and rallied for a 26-25 victory. In that contest, Hilltops quarterback Jared Andreychuk engineered a 75-yard two-minute drill touchdown drive near the end of the fourth quarter to win the game. The Colts have also received strong play from the quarterback position from John Kiesman, who spent time with the University of Regina Rams. Sunday’ clash might be decided by the special teams. In the first meeting on Aug. 16 between those two clubs, the Hilltops held a 13-10 third quarter lead, but blew the contest open, when linebacker Bobby Ehman blocked a Colts punt. Topper defensive lineman Dillon Buckle recovered the blocked kick in the Calgary end zone for a Saskatoon touchdown, and the Hilltops went on to claim a 31-10 victory in Calgary. When the Colts thumped the Hilltops on Oct. 11 in Saskatoon, Calgary had troubles on at least three long snaps in punt formation. You can expect Hilltops special teams coach Matt Yausie will unleash a full out punt block to force a big play until the Colts show they have corrected their execution troubles in that situation. That might make the difference in this year’s PFC title game. Saskatoon Minor Football Field should be the site of some great drama on Sunday. It almost makes you wish these team could kick things off right now. If you have any comments you want to make about this blog post, feel free to email them to stankssports@gmail.com. Marley Ervine, right, celebrates scoring a goal for the Huskies. It seemed like everything Marley Ervine touched turned to gold for the University of Saskatchewan Huskies women’s hockey team. The feisty fifth-year forward had a goal and three assists to power the Huskies to a 5-3 victory over the University of Regina Cougars on Friday night at the Rutherford Rink. The Kindersley product is well known for getting in the dirty areas and mixing things up physically against opponents, who are usually bigger than she is. Those battles have also included a little bit of trash talking. With the Huskies missing Kaitlin Willoughby, their leading scorer from last season, with an undisclosed injury, Ervine ended up being in the right place at the right time in what was a 1980s offensive style of game. In the opening 20 minutes, the Huskie jumped out to a 1-0 lead, when right-winger Hailey Tyndall fired home a shot that went between the legs of Cougars defender Jolene Kirkpatrick to bulge the twine. With the Huskies working on the power play later on in the frame, Ervine picked up her first helper, when rookie defender Leah Bohlken fired home a shot through a screen to net her first career Canadian Interuniversity Sport regular season goal. The hosts expanded their edge to 3-0 at the 6:12 mark of the second, when Ervine and rookie centre Elizabeth Salyn combined to set up Rachel Johnson for her third goal of the season. Just when it looked the Huskies were going to run away with things, the Cougars came to life scoring two goals 39 second apart just past the midway point of the second to cut the Huskies lead to 3-2. First, fourth-year veteran Meghan Sherven batted home a close in rebound chance on the power play and Bailey Braden quickly followed up with an even strength marker. Marley Ervine speeds down the left wing for the Huskies. Working again on the power play, the Huskies jumped back ahead 4-2, when Ervine got the puck to the point to offensive defender Julia Flinton who slipped home a seeing-eye shot for her first goal of the season. A short time after that tally, the Cougars pulled staring rookie goalie Jane Kish, who turned away 16-of-20 shots fired her way. Toni Ross went in with 5:39 to play in the second, and she turned away 10-11 shots in relief. Just under a minute after entering the contest, Ross was beaten on a good individual effort by Ervine to give the Huskies a 5-2 edge. Before the second ended, the Cougars cut the gap to 5-3, when sophomore forward Caitlin Dempsey tucked a shot over the shoulder of Huskies goaltender Cassidy Hendricks on a penalty shot. Hendricks was solid overall on Friday making 33 saves to improve her Huskies career regular season wins record to 37. With the victory, the Huskies improved to 5-1-1, while the Cougars fell to 4-3. The two teams meet again on Saturday at 7 p.m. at the Co-operators Centre in Regina. NOTES ­– Huskies third year veteran forward Kori Herner left Friday’s game in the second period with an injury. The injury bug has taken a big bite out of the Cougars in the early part of the season. They played with only 15 skaters on Friday, and among their missing was their leading scorer from a season ago in Kylie Gavelin and fourth year veteran defender Krista Metz. Huskies defender Alyssa Dobler played in her 105th consecutive career game for the Huskies including regular season, playoffs and the Canadian Interuniversity Sport championship tournament. The fourth-year veteran has never missed a game in her career. Dobler had received a major penalty and a game misconduct for a checking from behind infraction in Huskies 3-1 road victory over the University of Lethbridge Pronghorns last Saturday, but no suspension resulted from that play. The Huskies are rated 10th in the CIS’s top ten rankings. The Huskies men's hockey team take warm-ups wearing Cody Smuk jerseys. The late Cody Smuk exemplified the phrase, “No one outworks the Dogs,” and it is only fitting his memory will be front and centre for a pre-game tribute. On Saturday, the University of Saskatchewan Huskies men’s hockey team will retire Smuk’s #24 jersey before their 7 p.m. clash with the University of Regina Cougars at the Rutherford Rink. This will mark the first time the Huskies have retired a number. Smuk played four seasons for the Huskies from 2010 to 2014 collecting six goals and 14 assists in 89 regular season games. He was best known for his gritty and hard-working style of play, as well as being the perfect glue guy teammate in the dressing room. The hard-hitting forward, who played in the WHL with the Chilliwack Bruins, Lethbridge Hurricanes and Moose Jaw Warriors, passed away after a battle with cancer that lasted over a year in June at the age of 26. Before taking the ice for games, all the members of the Huskies men’s team have been wearing #24 Smuk jerseys during warm-ups in tribute of Smuk. That practice is expected to last for the whole season, and it will be repeated before Saturday’s game. Smuk's parents, father Marty and mother Darla, and his financee, Stephanie Vause, will take part in the pre-game ceremony. The Cody Smuk banner that hangs at the Rutherford Rink. On the ice on Friday, the Huskies, who are rated fourth in the CIS’s top ten rankings, improved to 5-0 downing the Cougars in Regina 3-1. Sean Aschim, Zak Stebner and Logan McVeigh all netted singles for the Huskies. Trent Lofthouse replied for the Cougars, who fell to 1-4. Blake Voth made 36 saves to earn the win in goal in his first start of the season for the Huskies. Dawson MacAuley turned away 27 shots taking the loss in the Cougars net. Hilltops safety James Vause hits Rifles receiver Marty Riddick. James Vause provided the spark the venerable Saskatoon Hilltops were looking for. Entering the second half of Sunday’s Prairie Football Conference semifinal match with the visiting Winnipeg Rifles at Saskatoon Minor Football Field, the Hilltops held a 21-14 edge in what had turned out to be a tough battle in the first half. The Rifles had the first possession of the second half and were looking to drive downfield for the score that would tie things up, but Vause, a second-year safety, stepped up making an interception near midfield – his second pick of the contest - to turn the game around. The Hilltops quickly cashed in on that pick on their ensuing offensive possession, which was capped by a 15-yard touchdown run by Logan Fischer. That started a surge of 28 points for the Hilltops, who cruised to a 49-21 victory. They advance in the Canadian Junior Football League playoffs to host the Calgary Colts in the PFC final this coming Sunday at 1 p.m. at SMF Field. The Colts claimed the other PFC semifinal match traveling to Regina this past Sunday to down the host Thunder 17-3. In the Hilltops win over the Rifles, turnovers proved to the deciding factor. The Hilltops forced the Rifles to give up the ball seven times, which included three times on downs, twice on interceptions and twice on fumbles. They turned those takeaways into 28 points, while the Rifles only forced one turnover intercepting Hilltops quarterback Jared Andreychuk near the end of the first half. Logan Fischer runs in a Hilltops score from 12 yards out. Turnovers proved key in allowing the Hilltops exit the first half with a lead, as the Rifles rolled up 366 yards of offence. Saskatoon had 262 yards of total offence through the first 30 minutes. The first key Rifles giveaway came on downs, when they were stuffed on a third and one gamble from the Saskatoon 28 just past the midway point of the first quarter. Saskatoon quickly drove 82 yards the other way on a series that ended with Andreychuk hitting slotback Evan Turkington on a 21-yard scoring strike for a 7-0 lead. Shortly before the first quarter ended, Rifles running back Ogidan Odun fumbled the ball away around the Saskatoon 40, and Hilltops defensive end Blake Hermann made the recovery for the hosts. The Hilltops drove downfield on the ensuing possession, which ended with a 21-yard scoring run by Andreychuk just 11 seconds into the second quarter to give the hosts a 14-0 lead. The Rifles didn’t go away. They put together a long drive of their own, which ended when quarterback Jamie Ybarra hit Brendan Naujoks on a five-yard scoring toss to cut the Hilltops edge to 14-7. Saskatoon extended its lead to 21-7, when Andreychuk found slotback Evan Kopchynski on a 13-yard touchdown pass. Winnipeg responded with a long drive that saw Ybarra hit Xander Tachinski on a four-yard scoring toss with 69 seconds to play before halftime. The Rifles proceeded to get their one turnover, when defensive back Stefan Conway intercepted Andreychuk with 52.9 seconds to play. Winnipeg drove into field goal range, but Brad Mikoluff’s attempt was blocked by Hilltops defensive lineman Matt Kozun. With the Rifles, who entered the match on a three-game winning streak, looking to make a major upset, Vause stepped up with his big pick. After Fischer scored to put the Hilltops up 14, he ran in another major from 12 yards out to give the Toppers a 35-14 edge. He finished the contest running for 130 yards on 19 carries. Andreychuk found Kopchynski on a 30-yard streak passing play to extend the Hilltops edge to 42-14. After forcing the Rifles to give up the ball on downs, the Hilltops scored their final major of the game on the ensuing possession, which ended with a four-yard scoring run by Des Vessey. Winnipeg added the game’s final score with 15.9 seconds to play in the fourth quarter, when Ybarra hit Julian Banares on a 24-yard scoring toss. Andreychuk completed 15-of-21 passes for 276 yards, three touchdown passes, while throwing one interception for the Hilltops. With the Hilltops up big, he was pulled at the start of the fourth quarter for backup Jordan Walls. Ybarra connected on 24-of-41 passes for 350 yards, three touchdown passes, while throwing two interceptions for the Rifles. Winnipeg running back Michael Ritchott carried the ball 18 times for 119 yards, while Tachinski caught seven passes for 107 yards for the Rifles, who finished at 4-5 overall. The Hilltops, who are 8-1 overall, finished off their PFC semifinal win kicking back into high gear, which will be key with the steadily improving Colts, who are 6-3 overall, coming to town. The Hilltops and Colts will meet in the PFC final for the second straight year. Saskatoon claimed last year’s encounter 27-7 before moving on to win the Canadian Bowl to cap their 17th CJFL title win. Hilltops DL Connor Guillet takes down Rifles QB Jamie Ybarra. The two split their two regular season meetings. The Hilltops took the first contest 31-10 in Calgary on Aug. 16 to open the regular season for both teams, and the Colts claimed the second encounter 34-4 in Saskatoon to close the regular season for both teams. Saskatoon rested a lot of its regulars for most of the second game. The winner of the match between the Hilltops and Colts will host this year’s Canadian Bowl on Nov. 7, so the upcoming rubber match between the two sides will likely be an epic one. NOTE – The Hilltops were without star fifth-year defensive lineman Blake Adams in the PFC semifinal due to a left knee injury suffered in the team’s final regular season game. If you have any comments you would like to pass along about this blog post, feel free to email them to stankssports@gmail.com. Check out more game photos on Twitter @StanksSports. Connor Cox tucks home the OT winner for the Huskies. Connor Cox believes he accomplished a first on Saturday night for his hockey career. The 23-year-old defenceman netted the winning goal in double overtime to lift the University of Saskatchewan Huskies to a 4-3 victory over the University of Lethbridge Pronghorns at the ancient Rutherford Rink. At the 2:49 mark of a five minute three-on-three overtime period, Huskies rookie forward Kohl Bauml sprung Cox on a partial breakaway slipping a pass behind a Pronghorns defender. Cox cut across the face of the Lethbridge goal and slipped home the winner short side, when Pronghorns goaltender Dylan Tait tried to come out for a poke check. “It was pretty special for me,” said Cox, who spent five seasons in the Western Hockey League with the Moose Jaw Warriors, Saskatoon Blades and Everett Silvertips before joining the Huskies. “I don’t think I have ever gotten an overtime goal for myself in a career, not that I can remember anyways. The Huskies other overtime victory this season was a 6-5 triumph on the road over the University of Calgary Dinos on Oct. 9. Connor Cox celebrates scoring an OT winner for the Huskies. In the extra time win at home over the Pronghorns in a Canadian Interuniversity Sport clash, Cox almost couldn’t believe he found himself in a one-on-one situation with an opposing goaltender. Defencemen don’t really get too many chances in deep in the offensive zone. “To be honest, I actually panicked at the start, because I wasn’t sure what I was doing down there,” said Cox. “It was a partial break. Saturday’s contest between the Huskies and Pronghorns was a back-and-forth match, where the hosts held a 1-0 lead after the first period and a 2-1 edge after the second frame. In the third, the Pronghorns jumped ahead 3-2 thanks to a pair of goals coming from the stick of Brandon Clowes. It appeared the visitors were going to sneak out of “the Bridge City” with a victory, but that changed when Pronghorns forward Justin Valentino took a hooking infraction with 2:22 to play in the third. On the ensuing power play, Bauml centred a smart pass out to linemate Andrew Johnson, who potted the equalizer for the Huskies to tie things up at 3-3 with 54 seconds to play. Kendall McFaull and Bauml also had singles for the Huskies, who improved to 4-0. Ryon Moser picked up the Pronghorns (1-2-1) other goal. Jordon Cooke made 31 saves to earn the win in goal for the Huskies. Tait turned away 46 shots taking the extra time setback in the Pronghorns net. Kohl Bauml had a goal and two assists for the Huskies on Saturday night. The teams played through a scoreless five minute four-on-four overtime period before moving into a three-on-three session, where Cox picked up the winner. Cox, who is from Lethbridge, said he wasn’t sure if his winner was the most fancy goal he had ever scored. “It sure felt the best for sure,” said Cox. “Playing against a bunch of guys I know from back home was pretty special for me and going against a goaltender that I know pretty well in Dylan Tait it felt pretty good. The Huskie return to action this coming Friday, when they travel to Regina to face the University of Regina Cougars (1-3). Leah Bohlken had a pair of assists on Saturday for the Huskies. The U of Saskatchewan Huskies women’s hockey team knocked the U of Lethbridge Pronghorns out of the undefeated ranks during a successful visit to southern Alberta. On Saturday in Lethbridge, the Huskies dumped the Pronghorns 3-1 in a CIS contest to improve to 4-1-0-1. Kennedy Harris, Rachel Johnson and Kori Herner all netted singles for the Huskies, while Leah Bohlken picked up a pair of assists. Tricia Van Vaerenbergh replied for the Pronghorns, who fell to 5-1. Cassidy Hendricks made 20 saves to earn the win in goal for the Huskies. Alicia Anderson made 31 stops to take the loss in goal for the Pronghorns. During that win, steady Huskies veteran defender Alyssa Dobler was given a major penalty and a game misconduct for a checking from behind infraction, which might be reviewed for a possible suspension. The Huskies and Pronghorns also met on Friday in Lethbridge, and Jocelyn Sabourin netted the winner at the 3:12 mark of overtime to lift the host side to a 4-3 victory. Harris, Courtney Cormack and Kaitlin Willoughby all picked up singles for the Huskies, while Hendricks made 31 saves in goal. Cormack’s tally was her first in CIS regular season play. Brett Campbell, Mackenzie Gal and Katelyn Breitkreuz all had singles for the Pronghorns, while Anderson made 27 saves in goal. The Huskies return to action this coming Friday, when they host the U of Regina Cougars (4-2) at 7 p.m. at the Rutherford Rink. Andrew Johnson burst into the offensive zone for the Huskies. It was a game the late Saskatoon StarPhoenix sports editor Doug McConachie would have loved. Known as one of the great characters in Canada’s sports media circles, McConachie would almost fall out of the press box due to over excitement, if he was witnessing a really good hockey game. McConachie was best known for the columns he wrote on the WHL’s Saskatoon Blades, but he would have been pumped had he seen what took play at the ancient Rutherford Rink on the University of Saskatchewan campus on Friday night. In an action packed match, the host Huskies downed the University of Lethbridge Pronghorns 3-2 in a Canadian Interuniversity Sport men’s hockey clash. While the contest wasn’t the highest scoring game you might see, it was filled with tonnes of offensive chances. Huskies netminder Jordan Cooke and Pronghorns counterpart Dylan Tait, who are both WHL graduates, both put on shows. Cooke turned away 24 shots, and his best stop might have come on an early second period breakaway, when he made a kick save on Pronghorns defenceman Tim Campbell. Tait, who recently beat testicular cancer, stopped 31 shots, and he was tested constantly in tight, as the Huskies drove hard to the net. The Huskies also appear to have found a new star in the early going in rookie forward Andrew Johnson, who seems to have the golden touch around the net. The local product accurately snipped home his club’s second and third goals of the night. The first tally came late in the second and gave the Huskies a 2-1 edge going into the second intermission. The second marker came just 56 seconds into the third to put the host side up 3-1. Dylan Tait makes a stop in the Pronghorns goal. In the Dog’s 3-0 start, Johnson has netted the winner in every contest and has four goals and an assist so far this season. The Pronghorns made their share of plays as well in falling to 1-2. Sophomore left-winger Justin Valentino set up both his squad’s goals. His first helper was put in by Cassidy Mappin, who gave the visitors a 1-0 early in the first period. Valentino’s second helper came on a goal from Dalton Sward, who scored just before the midway point of the third period to cut the Huskies edge to 3-2. Jesse Ross accounted for the Huskies other goal with a beauty snipe of his own in the first frame. Both teams transitioned up and down the ice at a very high tempo, blocked shots in the defensive end and threw some solid clean hits. The pace moved so fluidly that all the officials had to do was stay back and let both sides play. Huskies goalie Jordon Cooke pushes a puck out of harms way. The men in the striped shirts had to do their biggest work after the third period expired, as what amounted to a minor scrum occurred behind the Huskies net. The mix up included a lot of wrestling and angry shouting but not much more than that. The Huskies entered Friday’s game as the fifth rated team in the CIS’s top ten rankings. The spectators saw a great show, and if Friday’s game is a sign of things to come, the old barn on the U of S campus is going to be the place to be. The Huskies and Pronghorns go at it again Saturday at 7 p.m. at the Rutherford Rink. NOTE - The Huskies players all hit the ice for warm ups sporting #24 jerseys like the one that was once worn by team alumnus Cody Smuk, who passed away in June due to cancer. The team plans to keep doing that all season to honour the late gritty and hard working forward. Hilltops OL Jordan Hydomako walks to the field with his parents. For 16 members of the Saskatoon Hilltops, they are enjoying their final days as players for the storied Canadian Junior Football League club. If the team goes all the way to host this year’s Canadian Bowl on Nov. 7, it means those fifth-year graduating players have at most 23 full days starting on Friday to enjoy suiting up for the blue and gold for practices and games. They only have at most 23 full days to enjoy spending time with their teammates. When Nov. 8 rolls around, there will definitely be no more practices or games to take part in as a CJFL player. The Hilltops begin their playoff run on Sunday, when they host the Winnipeg Rifles in a Prairie Football Conference semifinal contest at 1 p.m. at Saskatoon Minor Football Field. Saskatoon topped the PFC regular season standings with a 7-1 mark, while Winnipeg finished fourth with a 4-4 record. On paper, the contest is a severe mismatch, as the Hilltops swept the two regular season meetings between the clubs outscoring the Rifles 115-17. The Toppers are expected to win this first contest on the post-season trail, but the results afterwards are not a sure thing. Even with that in mind, the veterans have to relish the limited time they have left and not take anything for granted including that playoff match with Winnipeg. The soon to be graduates include Blake Adams, Chad Braun, Nathan Heide, Tyrell Hering, Jordan Hydomako, Evan Kopchynski, Matt Kozun, Davis Mitchell, Preston Njaa, Quinn Pierce, Derek Sadownick, Brad Schnitzler, Terry Thesen, Austin Thorarinson, Brett Thorarinsson and Evan Turkington. Hilltops LT Terry Thesen guides the way for Logan Fischer. They have had a huge hand in adding to the Hilltops proud legacy. During their years, the Hilltops claimed the Canadian Bowl three times, and they would all love to add a fourth title this season, which would be the team’s fifth CJFL championship in the last six years. The fact that the end is getting closer became more real during the Toppers final regular season home game last Sunday. In what has to be one of the most heartwarming annual traditions any sports team has in Canada, each graduating Hilltops vet was introduced to the crowd making the walk out of the tunnel with their parents. The parents were almost all decked out in cool looking team gear. That moment was definitely something the players and the parents will never forget, and it gives the parents recognition for the support they have given their boys over the years even before joining the blue and gold. A lot times, you can find the parents along with the players’ brother and sisters out watching practice in order to further share in the Hilltops experience. As the final days move on for the graduates, they will experience other memories they will never forget, and they won’t likely all revolve around winning games. The memories will include telling jokes between drills at practice at Ron Atchison Field or in the dressing room at the Hilltops clubhouse. Just being around the other guys, who become like family, will be a big thing that is missed. For anyone that has spent any around the Hilltops clubhouse, you can’t miss the family feeling atmosphere at that place. Going out into the community and being recognized is another thing that will be missed. The Hilltop players have always carried themselves with humility and class, but it always feels special to hear a good word from a complete stranger, who follows what the team does. Brett Thorarinsson boots the ball away for the Hilltops. Not all the graduating veterans might be able to play these final playoff games, as like any football season the injury bug has something to say. The hearts of a lot of Toppers fans dropped when Adams, who has been an extremely popular member of the team’s star defensive line, suffered a left knee injury in the final regular season game and is questionable for the post-season. If they can’t play, the injured graduating players will likely be passing on encouragement and coaching tips to those that will fill their roles to keep adding to the Hilltops experience. The final days are indeed here for the graduating players, but the best time is still right now. You can be sure each will ensure every day is a good day, and as those good days add up, there is a good chance they will culminate with one last championship celebration memory on Nov. 7. The Colts defence nails Hilltops backup running back Colin Stumborg. The Hilltops entered their final regular season game with first place already locked up in Prairie Football Conference as well as home-field advantage through the Canadian Junior Football League playoffs. With that already in mind, the Saskatoon coaches had to deal the challenging decision to play or rest their regulars with a chance to post a perfect 8-0 regular season mark. The coaches elected to rest the regulars after the first quarter. With that said, it appeared the Hilltops players both starters and backups were already looking forward to the playoffs. Calgary played Sunday’s clash at Saskatoon Minor Football Field like it mattered and the result turned out to be a rare setback that saw the Hilltops fall in blowout fashion. Saskatoon finished the regular season with a 7-1 record and saw its 15 game winning streak including regular season and post-season play come to an end. While the Hilltops wanted to prevent losing any players to injury, the final result on the scoreboard against the Colts, who finished at 5-3, was shocking. That last time most in Saskatoon can recall the Hilltops suffering that lopsided a setback came in the days when the Regina Rams were still in the CJFL. The Rams hammered the Hilltops 48-10 in the 1998 PFC final, which was the last encounter by those two clubs, on route to winning the Canadian Bowl before moving on to the Canadian university ranks. The most disappointing thing about Saskatoon’s loss to Calgary on Sunday was it felt like the whole Hilltops team was off. A promising early offensive series by the Hilltops was nixed, when receiver Davis Mitchell fumbled the ball away. That turnover didn’t cost the Toppers, but Calgary took a 3-0 lead in the first quarter on a 42-yard field goal from Kyle Bryne. Dylan Minshull ran for 195 yards on 33 carries for the Colts. Near the end of the first quarter, Hilltops starting quarterback Jared Andreychuk appeared to hit receiver Evan Turkington with a four-yard scoring toss, but the touchdown was called back due to a penalty. The drive ended when Andreychuk was sacked, and he fumbled the ball away to the Colts defence. That was the starting signal caller’s last play of the contest, as the Toppers stuck with a plan to allow everyone on their roster to hit the field. Early in the second quarter, Brett Thorarinsson hit a 37-yard field goal for the Hilltops to pull them into a 3-3 tie with the Colts. From there, the contest was taken over by the visitors. The Colts went ahead 10-3 with 29.7 seconds to play in the second quarter on an 11-yard touchdown run by Dylan Minshull. Saskatoon opened the third quarter getting a point on a kick-off single from Liam Murphy, who took over the team’s kicking duties in the second half, to cut the Colts lead to 10-4. Calgary then hit full gear. Minshull ran in another major from 11 yards out, and Bryne hit a 30-yard field goal to extend Calgary’s lead to 20-4 at the end of the third quarter. Minshull, who had 195 yards rushing on 33 carries, scored his third major of the day on a nine-yard romp in the fourth quarter, and Colts starting quarterback John Kiesman hit receiver Kyle Brick on a 15-yard aerial major to round out the game’s scoring. Saskatoon turned the ball over four times on an interception and three fumbles. Calgary committed two turnovers off an interception and a turnover on downs. In the second half, both teams elected to keep the ball on the ground for most of the time with a lot of bland running plays. That tactic is used to dull video future opponents can use for study purposes. Besides the soft effort, it also felt like the Hilltops let a good team like the Colts off the hook in a way. The Colts moved the ball well even then the Hilltops had their starters in, and the win has to help the Calgary players get over a mental block when it comes to beating the Hilltops. Guided by a strong head coach in Matthew (Snoop) Blokker, the Colts could see the Hilltops down the road in a possible PFC final match. The Hilltops lost star DL Blake Adams to a left knee injury on Sunday. With that in mind, the injury worries were there Hilltops, and the injury bug did bite. In the short time the starters were on the field, Saskatoon star defensive end Blake Adams suffered a left knee injury in the second quarter, and he stood on the sidelines on crutches for the whole second half. If the fifth-year veteran can’t go in the post-season, his absence will provide a sizable hole in the Hilltops lineup. The Colts will travel to Regina this coming Sunday in one PFC semifinal match to face the Thunder (6-2). The Thunder also closed their regular season on Sunday dumping the visiting Edmonton Huskies 29-6. The Hilltops host the Winnipeg Rifles (4-4) in the other PFC semifinal this coming Sunday at 1 p.m. at SMF. The Rifles concluded their regular season traveling to Edmonton on Sunday to slip past the host Wildcats 36-33. The Edmonton Huskies and Wildcats finished at the bottom of the PFC standings with respective 1-7 marks. If you have any comments you want to pass along about this blog post, feel free to email them to stankssports@gmail.com. Check out Twitter for more game photos @StanksSports. Huskies forward Marley Ervine, left, battles Dino Iya Gavrilova for a draw. The University of Saskatchewan Huskies got a feel for just how unpredictable the Canada West women’s hockey ranks could be this season. Hosting the University of Calgary Dinos who limped into a pair of games at the ancient Rutherford Rink with an unexpected 0-2 mark, the Huskies picked up a solid 3-2 win on Friday night, but the Dinos collected their first victory of the season with a 3-2 comeback effort on Saturday. In Friday’s encounter, the Dogs led 2-0, 3-1 before holding to a 3-2 victory. Paige Anakaer, Marley Ervine and Hanna McGillvray scored for the Huskies. Chelsea Court and Stephanie Zvonkovic replied for the Dinos. Cassidy Hendricks made 18 saves to earn the win in goal for the hosts, while Sarah Murray turned away 27 shots taking the loss in goal for the visitors. The Huskies held the advantage in territorial play for lengthy stretches on Friday night and appeared strong. The Dinos didn’t looked like they would get a chance to make a rally until Zvonkovic pulled them to within 3-2 scoring with 63 seconds to play in the third. Despite the late goal to cut their edge to one, the hosts shut things down defensively to close out Friday’s victory in solid fashion. Kori Herner gets set to wire home a goal for the Huskies. With having won their first three regular season games, the Huskies got out of the gate slow on Saturday. The Dinos took a 1-0 at the 6:02 mark of the first on a power-play goal from Iya Gavrilova, who was a member of Russia’s team at the 2014 Winter Olympics. As the opening 20 minutes came to a close, the Huskies started string together a series of strong back-to-back shifts to turn the tide. The hosts came out flying in the second and constantly crashed the Dinos net with solid scoring chances holding a 14-7 in the shots on goal department. Anakaer, who is the Huskies captain, tied things up at 1-1 just past with midway point of the frame with a gritty positive bounce goal. Kori Herner put the Dogs up 2-1 late in the second breaking down the left wing into the Calgary zone and wiring a shot past Dinos goaltender Hayley Dowling. The Huskies couldn’t hold the momentum as the Dinos answered back with two goals that seemed to come out of nowhere to go up 3-2. Court potted the equalizer at the 5:17 mark and Cheyann Newman picked up the winner at the 11:37 mark. The home side tried to push back, but the rally attempt was big time hampered when Huskies star defender Julia Flinton was tagged with a double minor for checking to the head with 5:49 to play in the third. The Huskies killed off the penalties, but couldn’t find the equalizer despite mounting pressure in the Dinos over the contest’s final 90 seconds. Captain Paige Anakaer, middle, celebrates scoring for the Huskies. Jerrica Waltz made 26 stops to get tagged with the loss in the Huskies net, while Dowling turned away 29 shots to earn the win for the Dinos (1-3). While Saturday’s setback to the Dinos might have been a bit disappointing, the Huskies have to be happy they are off to a 3-1 start. Their next challenge should be an interesting one. This coming Friday and Saturday, they travel to Lethbridge to face the University of Lethbridge Pronghorns, who are off to a surprising 4-0 start with a pair for road sweeps over the University of British Columbia Thunderbirds in Vancouver and the University of Alberta Pandas in Edmonton. The Huskies have played fairly sound structurally in their first four outings. Going forward, they just have to keep finding ways to improve on a day-to-day basis, because it appears the Canada West conference is going to be up for the taking. 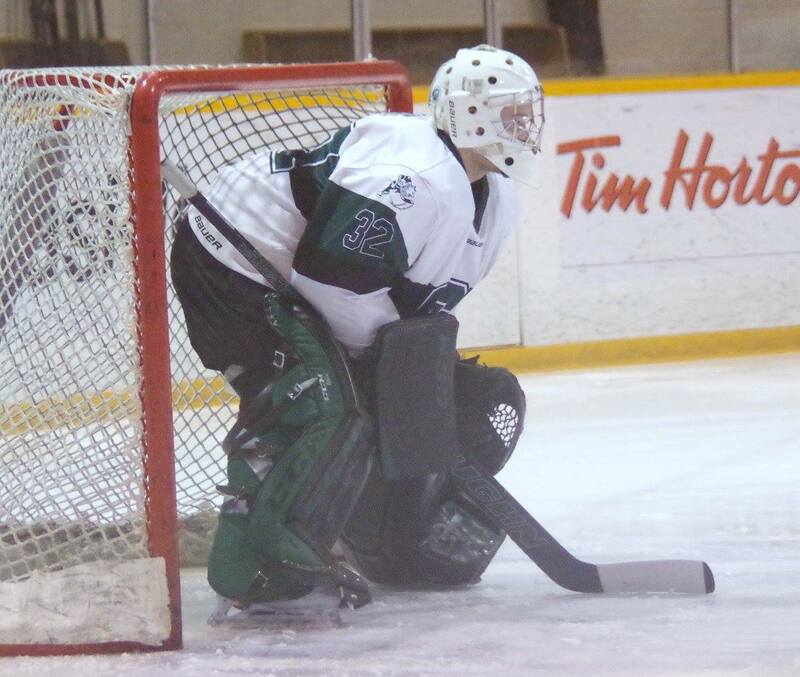 Jordon Cooke backstopped the Huskies to a pair of victories. The Huskies men’s hockey team seem to like variety when it comes to victory. The Dogs opened the regular season on the road in Calgary and swept away the Dinos, who are expected to be a powerhouse this season. On Friday, rookie forward Andrew Johnson scored 53 seconds into overtime to lift the Huskies to a 6-5 victory. Zak Stebner, Levi Cable, Michael Sofillas, John Lawrence and Kendall McFaull all netted singles in regulation for the Huskies. Spencer Edwards, Chris Collins, Kevin King, Dylan Walchuk and Elgin Pearce replied with singles for the Dinos. Jordon Cooke made 25 stops to earn the win in goal for the Huskies, while Steven Stanford turned away 23 shots taking the loss in the Dinos net. The wild affair saw the Dinos lead 2-0 after the first, and the Huskies hold leads of 3-2 and 4-3 in the second. The Dinos took a 5-4 edge in the third, before the Huskies forced overtime. On Saturday, Johnson scored a short-handed goal at the 11:36 mark of the second, and that proved to be the difference in a 1-0 victory. Cooke made 27 stops for his second career CIS shutout, while Myles Hovdebo turned away 21 shots taking the setback in the Dinos goal. The Huskies open their home schedule this coming Friday and Saturday when they host the Lethbridge Pronghorns (1-1) at 7 p.m. both nights at the Rutherford Rink.